Another day, another chapter in The Life and Times of Tara Markov. Today it's all about teamwork... let's watch and learn. We open inside Titans Tower on New Year's Eve with Speedy, Kid Flash and Frances Kane. They have just taken out the Brotherhood of Evil, and we learn that Phobia had triggered Raven into attacking Wally. The trio talk, and Wally comes to the conclusion that perhaps it's time for him to step down to being a part-time Titan. They chat for a moment too long, and the Brotherhood comes to. Phobia wakes up and forces the teens to face their worst fears, before she and the rest of the Brotherhood take them out... take a lock of Fran's hair... and take their leave. We shift to a ratty apartment in Brooklyn where Terra had been held against her will by the terrorists. Gar is less than impressed with the digs, and isn't all that shy about it... he asks Terra why she didn't just use her powers against her captors, and she sidesteps the question... before debuting her new and improved superhero costume. Terra asks if Gar thinks she's "Titans material", and he's too afflicted with puppy love to notice how pushy she's getting on the subject... instead he's just like... it's not my call, doll. We join Robin, Starfire and District Attorney Adrian Chase as they enter the television set for Bethany Snow's news program "Snow Storm". She requested an audience with them, and they cannot help but think they're about to climb right into a spider's web. Inside, they are taken aback by Snow's change of heart when it comes to the Church of Brother Blood. She's now opposed to them and terrified for her own safety. She begins sharing damning photographs of what goes on beyond the walls of the church, when a gunman begins firing into the studio. Starfire gives chase, but to no avail. At this point, Snow is frantic, and swears that she'll spill the beans so long as she's protected. We shift scenes to Cyborg. He's visiting his "friend" Sarah from the Special School... boy is he surprised when it's not Sarah but her fiance Mark who answers the door. Vic never knew Sarah was even involved with somebody else, and after a few moments of uncomfortable banter he excuses himself. As he heads across town he blames himself for misreading Sarah's signals... mistaking her complete acceptance of him as something more. We briefly return to observe Adrian Chase deliver Bethany Snow safely back to her apartment. She enters alone, to find a member of Brother Blood's church waiting for her. Snow smiles, and informs her "sister" that they "bought" it. Back at the Tower, the Titans assemble. Speedy shares what had gone down between the Brotherhood and Raven. 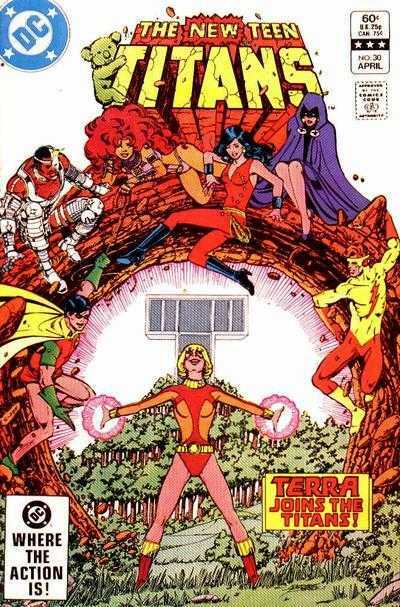 Gar gleefully introduces the team to their newest member... Terra. You can almost feel about a dozen eyes roll at once. Robin gives her the "you can come along, but don't break anything" treatment... and makes mention of Wonder Girl's absence. Where oh where can Donna be? Why, she's getting ready to dine at the famous Rainbow Room with her special friend, Terry Long. He promises this will be a night to remember, and I can feel the pastrami sandwich I had for lunch rising in my throat. Next up, Raven. She is at St. Patrick's Cathedral... which is a strange place for her, indeed. She is approached by a Priest who offers to help her, even though she refers to herself as "Satan's Daughter". Their conversation is cut short by the sudden appearance of the Brotherhood of Evil. Phobia challenges Raven to "take it outside", as fighting in a house of worship is a bridge too far, even for a supervillain team with "Evil" in their name. Back at the Tower, the Titans are watching the "big ball" descend in Time Square on this New Year's Eve. Terra and Gar watch as the globe hits the sign... and nothing happens! Does that mean it's still 1982? Luckily, the Titans are quickly on the scene. The battle is pretty even, with both teams getting in some good shots on the other. It isn't until Frances Kane makes her presence felt, using her magnetic powers to wrap a water pipe around Phobia. Phobia realizes trying to mess with Kane's mind may not be in her best interests at the moment... and instead heightens the fear levels of several thousand New Yorkers! Pretty solid escape plan, if I do say so! The Titans weave their way through the crowd, as Robin begs Starfire not to do anything stupid... I love it! We wrap up our issue by checking in with Donna and Terry... and it happens... Terry presents Ms. Troy with a diamond, and pops the question. It's almost as though I don't need to write reviews for these Titans issues anymore... this was another excellent outing. Again, so many disparate vignettes woven to perfection. Everybody's story moves forward... and you'd swear there was more than 23 pages here. Let's start by discussing Robin, Starfire and the soon-to-be Vigilante. They're shocked to see that Bethany Snow has changed her tune. Snow was just such a wonderfully sleazy character around this time. This ain't the smiling hostess for Channel-52 (remember that?)... instead, this is a cold and manipulative character... even though she's squarely in the Brother Blood camp, you almost feel as though she's got a contingency in place to look after "number one". The Brotherhood of Evil... ehhh, this incarnation never really did much for me. Phobia is cool, but the others are kinda just there. They come across as goofy, and not in that "good" goofy way. Perhaps it has to do with their target being Raven, who is probably my least favorite Titan during this era. That's not really a slight... I mean, this roster is stacked... one's gotta be my least favorite! Cyborg realizing the girl he's been crushing on is engaged was pretty heartbreaking... what's worse, her fiance seems like a pretty cool guy. Hard to hate a guy like him. Vic blames himself for misreading the situation... but I gotta wonder, just how much he did. Speaking of engagements... emphasis on the "gag"... Terry Long pops the question to Donna Troy. I know my Long-bashing has probably gotten old by this point... but, he really is the worst. I suppose if I had to say one NICE thing about him... well, at least he's not Danny Chase. As much as I don't dig Terry, I gotta admit... the wedding story (Tales of the Teen Titans #50) was a wonderful issue. Definitely a high point in this already excellent series. Now, the girl of the hour... Terra. Quite the turnaround here... just a couple of issues back she had to be dragged to Titans Tower, kicking and screaming... and now, she's petitioning for team membership. This is part of why this era is so incredible... usually, when a team comes across a potential new member, it's the team that initiates the potential draft. Here, however... it's the exact opposite... the would-be draftee is actively campaigning to be added to the team. Despite the cover's proclamation, I don't think there was anything official about Terra's inclusion here... which is fine... I like her being more of an "outsider" at this point. I really like how, outside of Gar, Terra isn't yet privy to the civvies (names). Brooke Shields reads Superman... and you should too!